Thanks to Stoutmeister and the NM Dark Side Brew Crew for giving me the opportunity to write an article for them. 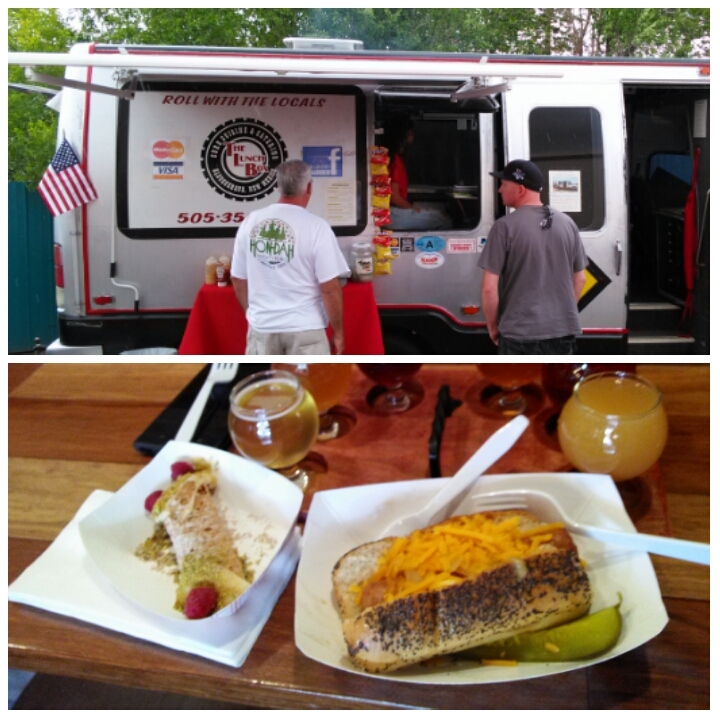 Today, with the help of my amazing hubby, John, I am reviewing Monday’s Food Truck Battle at Red Door Brewery. It was nice to have a second set of eyes and taste buds on this project. Temperture-wise, it was a perfect day in Albuquerque, although I had to retake some photos because a small bout of drizzling rain. Music at the event was acoustic classic rock provided by Mike Hogan. It was a perfect accompaniment to a relaxing afternoon at this brewery. The staff at Red Door was friendly and helpful, as always. We arrived early at the brewery and I ordered the Threshold IPA while John ordered the Paint it Black Milk Stout. We set up our plan of attack and ordered our flight of beers to pair with the offerings from the food trucks parked behind the brewery. Our order of sampling is unconventional, but seemed good at the time, so we went with it. The Toasted Bean’s waffle bite paired well with the milk stout. We started here simply because their pairing matched the beer we still had left, a half pint of Paint it Black. I wish we had ordered more from this truck. Co­-owner Jonna Stanger was friendly and helpful even though she was still busy setting up for this event. We ordered the ‘Funky Monkey’ Waffle Bite, which was a small quarter of a waffle, but very tasty as it was covered with banana, nutella, and whipped cream. The waffle bite went perfectly with the Milk Stout, so if you see this truck at Red Door in the future, you know what to order. The Lunch Box’s Apple Pie Cream Canolli, left, pairs well with Unhinged Cider, while the Jumbo Beer Brat, right, pairs well with Baby Got Bock. Our next pairing came from The Lunch Box, owned by Greg and Tina Ritt. Greg was also friendly and informative. He didn’t have an exact pairing, but told us that beer went with all of thier food. We tried the Jumbo Beer Brat with the Baby Got Bock (Maibock), because the brat was steeped in this brew. Needless to say, it was a good pairing. The hubby was feeling creative, to my benefit, and also ordered the Apple Pie Cream Cannoli, which went extremely well with Red Door’s renowned Unhinged Cider. 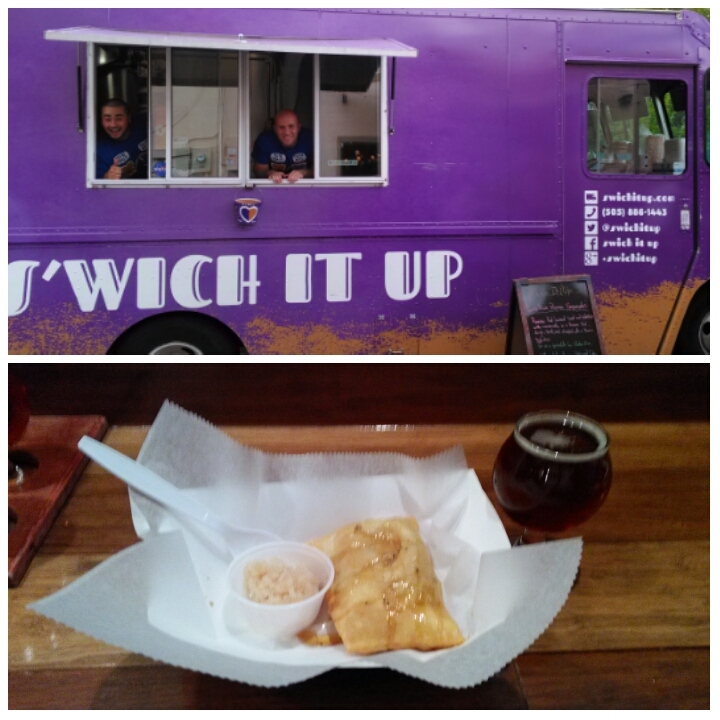 S’wich It Up’s Puerto Rican Empenadas pairs well with Roamer Red. Physicist Chef Anthony Salvango and his brother, Jason, are the owners of this enterprise. A lot of high intellect and creativity goes into their food. We experienced this by trying the Puerto Rican Roamer Empenadas, with a side taster of Italian ice made with the Unhinged Cider. Of course, this paired perfectly with Roamer Red. We are looking forward to trying more from this food truck in the future. 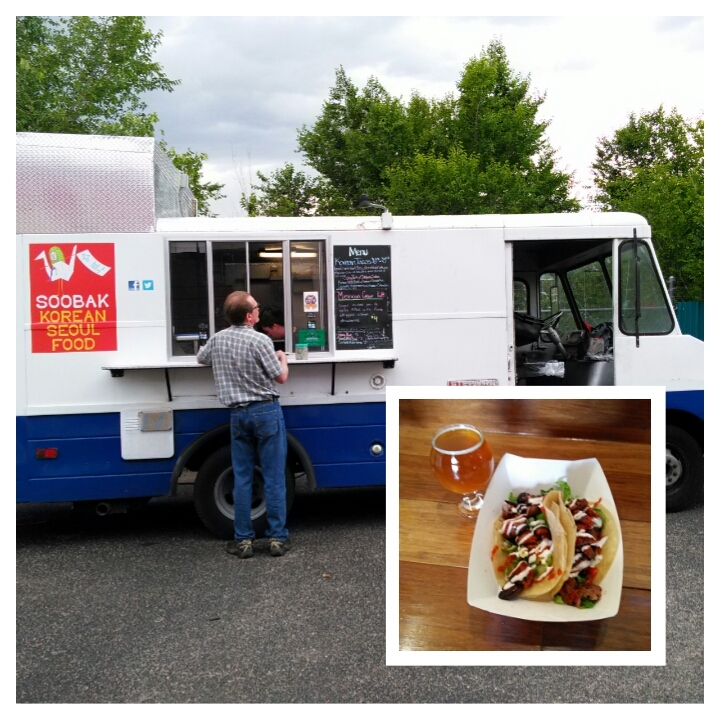 Soo Bak Foods’ Korean tacos have a spicy kick that pairs well with Threshold IPA. The spicy Korean BBQ Beef Tacos and Sauteed Mushroom Tacos were a perfect complement for the hoppy Threshold IPA. The hubby and I agree that this was our favorite pairing. Owner John Katrinak arrived late and I didn’t have a chance to talk with him before the lines formed. 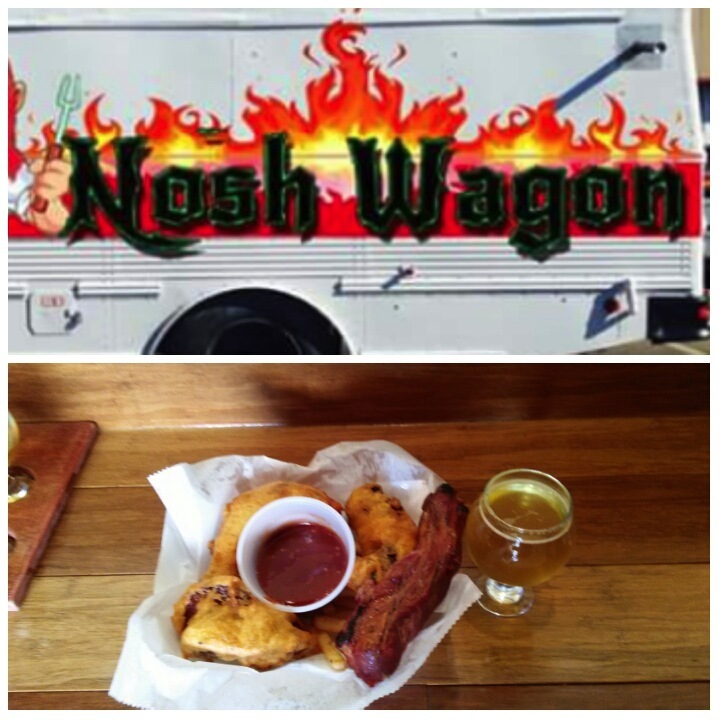 Nosh Wagon’s Night on the Towner was made with the Gateway Blonde, but would pair better with the red or IPA. Who wouldn’t like delicious, smoky ribs, dipped in beer batter and deep fried? Gateway Blonde was used for the batter, so we mistakenly tried to pair it with this offering called Night on the Towner. The smokiness and complex flavor of the homemade sauce made it an offset pairing. We agreed that the Roamer Red or the Threshold IPA would have made a better match. Owner Rusty McConnell took a break for a few to answer our questions. 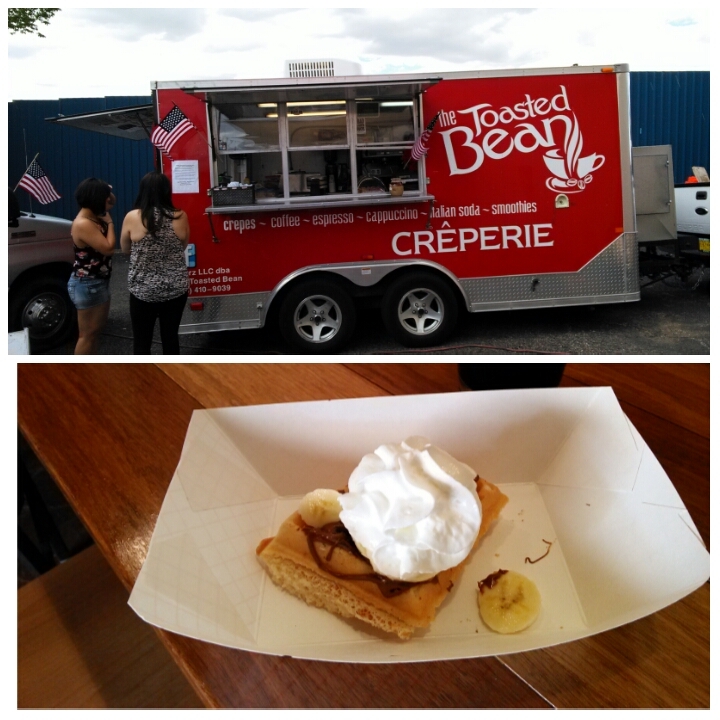 This newer food truck is rocking and I look forward to seeing them around ABQ again soon! This event made for a fun way to spend Memorial Day with friends and family in a relaxed environment, with great food and music. Now if you will excuse me, I am probably going to have to walk about five miles to burn it all off. But it was definitely worth it!